Ever heard of deep vein thrombosis? Well, now you have. 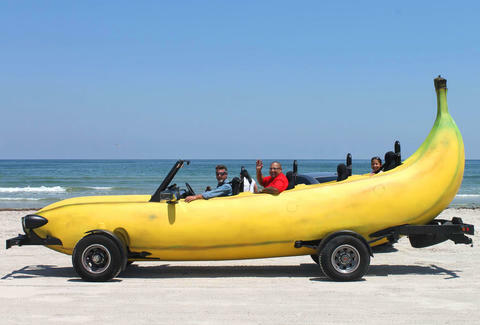 And you can thank the chassis editors responsible for the bananstrosity pictured above. WTF do any of the aforementioned have in common? No idea, but it makes sense to two brothers who aim to wheel this long, thick vessel around the world to raise awareness for DVT and completely ignore geographic science. Evidently the Big Banana Car -- an old Ford F-150 chopped and screwed into an inline four-seater -- has time-traveling capability as well, because they used it to go back and build a Geocities site dedicated to their journey. There, they explain why they chose the worst tasting of all car flavors for their campaign. Anywho, check the map or wait for them to pass through your town. And if you need a ride, give them a call. Seriously. It's a thing they offer. Just don't be too fat. 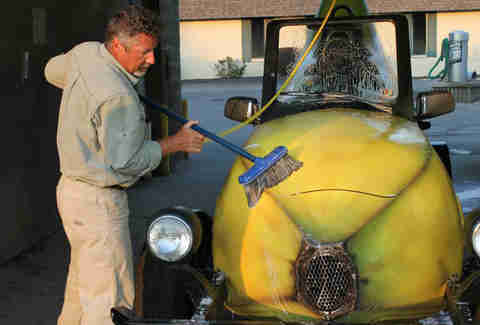 Driver Steve Braithwaite waxes his banana. Car.